The Nenets State Nature Reserve, one of the recently-established Russian nature reserves, boasts vast tundra expanses overgrown with multicolor mosses and lichens, walrus breeding grounds and noisy bird colonies. The arctic.ru website’s correspondent asked the reserve’s director Stanislav Zolotoi about local sights and how to get to the reserve. What is the Nenets Nature Reserve like? What can you say about its climate and endemic plants and animals? The Nenets State Nature Reserve is located in the Nenets Autonomous Area and covers part of the Malozemelskaya tundra. It includes the Russky Zavorot Peninsula, the Zakharyin coast along Pechora Bay, the lower floodplain of the Pechora River delta, part of the Neruta River delta and Bolvanskaya Bay, as well as several Arctic islands — Matveyev, Dolgy, Golets, Bolshoi and Maly Zelentsy islands. Most of its territory is covered by seawater. The reserve's total area is 313,400 hectares. The reserve and its vast tundra landscapes have a sub-Arctic climate. There are almost no forests here. First of all, water bodies and swamps cover most of the reserve and serve as an excellent habitat for waterfowl and coastal birds. In all, about 125 species, including geese, ember geese, ducks, swans, various sandpipers, seagulls and sparrows, roam the reserve. Rare bird species listed in the Red Data Book include the Bewick's swan and the lesser white-fronted goose. By the way, Bewick's swan mostly prefers to nest here, and this bird acts as the reserve's symbol and is depicted on the reserve's official emblem. Red-breasted geese sometimes nest here. We also have some birds of prey, including ernes, peregrine falcons, Arctic falcons and golden eagles. The reserve's substantial water bodies help to maintain rich marine life. Various fish migration routes, including those of spawning Atlantic salmon, pass through the reserve. The Arctic cisco, the loach, the Baltic whitefish, the peled (syrok), the pike, the broad whitefish, the ide and the perch inhabit the reserve. Breeding grounds of the Atlantic walrus, also listed in the Russian Red Data Book and protected by various international conventions, are sighted each summer on the Matveyev and Dolgy islands. The Nenets State Nature Reserve was established fairly recently, in 1997. Was the decision to set up the reserve linked with any environmental threats? We started establishing the reserve in the 1990s. Before that, intensive geological prospecting operations were conducted in the Nenets Autonomous Area, oil and gas deposits were discovered, and several major accidents were recorded here. 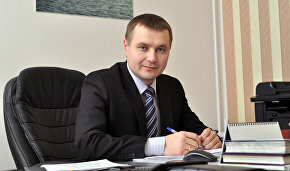 Therefore it was decided to establish a specially protected nature territory in order to preserve the unique Pechora River delta. A major 1980 accident at the Kumzhinsky gas-condensate deposit in the Pechora River delta spurred the decision-making process. Gas spewed out there for seven years until the well was shut off. Hydrocarbons also spewed into the Pechora River delta and reduced the Baltic whitefish population tenfold. Traditional economic activities, including reindeer overbreeding, also negatively affected the local environment. At that time, reindeer herds were quite large, and all these factors caused the degradation of reindeer pastures and tundra plant communities and ultimately contributed to our decision to set up the Nenets State Nature Reserve. This territory has a rich history. Many famous explorers and travelers stopped here, and indigenous ethnic groups, the Nentsy and the Pomors, lived in the region. Did they leave any traces at the reserve? Yes, we can say that our northern regions have been developed since times immemorial. The camps of fishermen and walrus / whale hunters are the main local facilities that still exist today. Nenets holy places can still be seen on the local islands. The current territory of the reserve is located on the route linking Pomor regions with Mangazeya, a Northwest Siberian trans-Ural trade colony and city in the 17th century. Fishermen and hunters all stopped here, and collecting eider duck eggs. 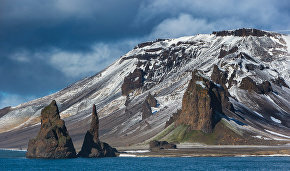 The islands of Matveyev, Dolgy and others were located en route to Vaigach and Novaya Zemlya. Dolgy Island also acted as a natural storm shelter. The Siberian Cemetery, discovered by explorer Ivan Ivanov, is located on Dolgy Island. In 1824, he wrote that, about 90 years ago, some 70 pilgrims sailed a large boat from the Ob River to the Solovetsky Monastery. While returning home in late autumn, they encountered impassable sea ice formations near Vaigach Island, and they decided to spend the winter on Dolgy Island. The ill-prepared pilgrims found a harbor off the northern tip of Dolgy Island but eventually died of scurvy and food shortages. And now this place is known as the Siberian Cemetery. You can still find graves and crosses there. As I have already said, the Nentsy have visited these islands since times immemorial, and they have viewed these islands as holy relics. Two Nenets worshipping sites that are no longer in use are still located on Dolgy Island. They resemble improvised mines and sites of various sacrifices, including idols, polar bear and reindeer skulls, as well as the bones of other animals, can be seen there. The German U-boat U-209 attacked and sank a ship convoy, including the tugs Komsomolets and Nord, the steamship Komiles and two barges, near Matveyev Island during the Great Patriotic War of 1941-1945. In all, 305 people were killed, with only 23 survivors. Experts are implementing ambitious environmental education projects at the reserve. Could you describe them? We are now focusing on environmental education, and we are trying hard to promote our territory, so that not only researchers and wildlife conservation experts would be drawn to it. We also need to preserve various unique landmarks, interesting landscapes and animal habitats. The reserve's management has an environmental education department, and our instructors are implementing various projects with school and university students and residents of the Nenets Autonomous Area. The reserve also takes part in annual Park Marches. This year's Park March will be held under the motto "Everyone is Important to Nature, Let's Preserve Biodiversity." The environmental education department's experts are now preparing for these events. Drawing contests and an exhibition will be organized along with lectures and workshops for school students. As the reserve is inhabited by Atlantic walruses, our administration and the WWF join forces to implement projects to raise public awareness of the need to save this highly vulnerable animal species. Each November, we hold the "Feed the Birds in Winter" event with the aim to help birds who spend the winter season here. Seven days ago, a travelling exhibition organized together with the Nenets Regional History Museum ended in the autonomous area. In April 2016, we will hold the second Bear Day event and invite people to visit an enclosure where a brown bear lives. What research projects are implemented at the reserve? Each year, the reserve attracts hundreds of thousands of migrating birds as an ideal stopover and breeding ground. Therefore annual ornithological research is conducted here, with experts registering waterfowl each spring and ringing sparrows. Geese and swans are ringed when waterfowl cast off their feathers. We implement other research projects during this time as well. We are also keeping an eye on Atlantic walrus breeding grounds. 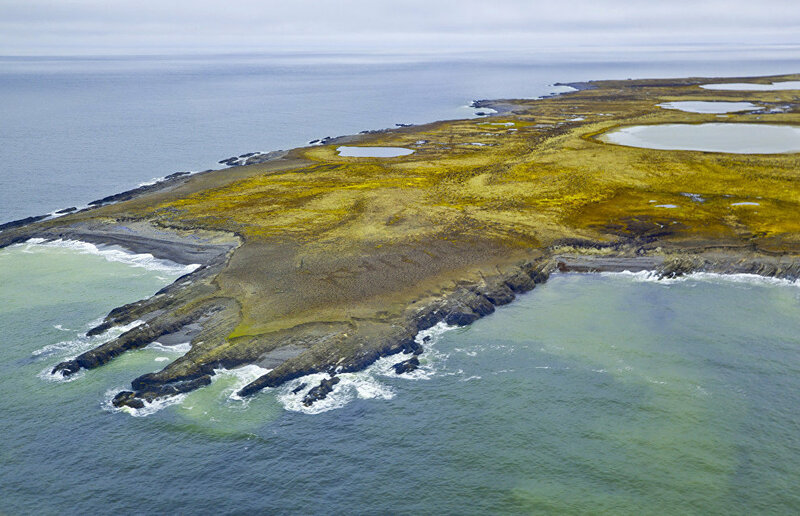 During the 2015 fieldwork season, our pilots were able to survey the walrus population at the Matveyev Island breeding ground several times. 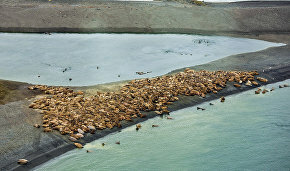 Incredibly, it turned out that over 600 walruses were simultaneously staying on the island. We teamed up with the Marine Mammals Council and set up camera traps on the Arctic island sanctuaries to determine how long the walruses stay there. Scientists from the Earth Cryosphere Institute have been monitoring local permafrost layers for many years. For their part, researchers from the Northern Department of the Knipovich Polar Research Institute of Marine Fishing and Oceanography annually estimate the size of Baltic whitefish and other valuable fish species each summer and winter. These are our main research projects. Do you enlist the help of volunteers at your reserve? Yes, we involve volunteers in our work. The most active volunteer projects were probably implemented last year. Candidates were chosen on a selection basis and asked to work to the best of their ability. Their work included repairing auxiliary premises, removing trash, implementing biotechnical projects, cutting hay for animals, and mostly rabbits. They also took video footage of our reserve and helped ring birds. Unlike a national park, reserves receive as few tourists as possible. But, realizing the need for expanded tourist activity, we have come up with several experimental routes for tourists. Our reserve is Russia's key ornithological territory, and we are offering three-day tours to birdwatchers, due in large part to the fact that birdwatching is becoming highly popular all over the world. One such tour called "Feathery Fighters" provides an insight into mating-season fights between birds, when we are witness to some of the most unusual feathery so-called "grooms." And the "Arctic House of Bewick's Swan" tours allow people to watch huge pre-migration waterfowl colonies at local water bodies. We have almost assembled a birdwatching tower, and one more platform is set to be installed at our reserve before the year is out.